Planning a big event in 2019? Whether it’s your year to get married, or host a lavish party at home, we are here to guide you along the way. National Event Hire can supply everything you could ever need for a lavish wedding, exquisite house party, or private event – furniture, cooking equipment, table settings and more – but before any of that, you need to choose a colour scheme, or theme. So, we’ve compiled a comprehensive guide to all the colour and theme trends for 2019 – everything from bridal dresses and wedding themes, to paint colours and interior design trends. There is so much to inspire you this year! The 2019 wedding colour trends are a perfect mixture of something old, something new, something borrowed, and something blue. This year, brides will incorporate trendy new colours with classic favourites. A good wedding colour palette has three or more shades and a common rule of thumb is 60-30-10. Aim to balance visuals with 60% of your primary wedding colour, 30% of the secondary, and 10% of the final accent colour. Here are the 2019 wedding colours we love and some creative seasonal palettes to inspire you! This is the season to play with delicate classics and trendy metallics. With flowers blooming, mix and match hues of timeless blush, wisteria, peony, and desert rose as your primary colours. Add gold to the mix for a bold secondary colour. Finish off with a vibrant green like emerald to provide a strong accent. Go bold with indulgently bright colours for a 2019 summer wedding. 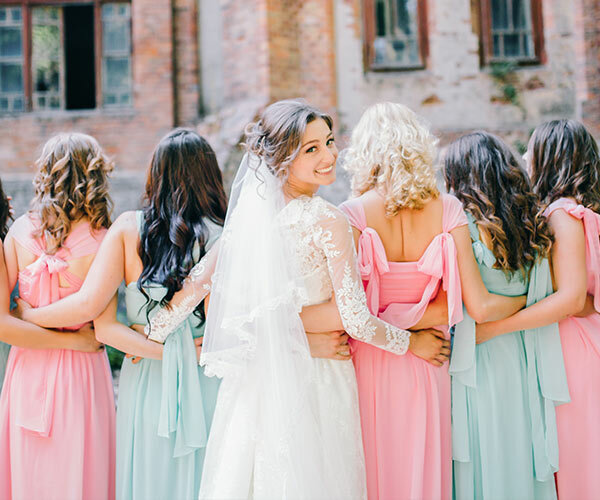 Let your bridesmaids choose between shades like berry, violet, emerald, or deep sea blue for your primary and secondary colours. Tie it all together with a timeless grey; or add a warm yellow to create contrast. This palette balances trendy deep burgundy with soft blush and champagne, a daring yet stunning choice for mix-and-match bridesmaid dresses. Consider fawn or latte for a neutral touch. These warm colours match the cooling autumn weather and look great with a metallic rose gold. They pair easily with the natural browns and greens of the landscape too. Bring striking tones into the dreary greys of winter with a deep pomegranate red like Bordeaux or claret. Accent these colours with the trendy metallic silver. To create balance and avoid oversaturation from the red, choose a cool gray or blue to go with it. We love the look of sky, fog, or dove. Altogether, this creates a calm background so the red and silver will really pop. Right, so we have the wedding colour scheme sorted – what about a theme? You don’t have to have a theme, but it’s a really good idea to make your wedding planning smoother and easier. Organic greenery wedding: Greenery is the hottest thing since sliced bread and it’s no wonder why…it’s beautiful, a little goes a long way and it’s affordable. Sparkles: From invitations to attire and linens and even cakes, a little (or a lot) of bling is all the rage! Fine Art: Think Monet, Renoir, Degas…and the way their paintings make you feel is exactly how your want your guests to feel. Romantic evening wedding: A wedding should be all about the love and upping the romance factor never hurt…candles, flowers, mood lighting, music, and even food can all set a romantic tone and make everyone swoon! Moody Romance: It’s a little dark and maybe even edgy, but it doesn’t lack in romance, which is why this works so well. Use burgundy, marsala, and maroons for this one to pop. Fairytale theme wedding: Whether it’s your interpretation or a Beauty and the Beast theme, the whimsy will delight the young and old at heart just the same. From Duchess-inspired halternecks, to Cindy Crawford-esque short dresses and even the rise of the bridal kaftan, these are the trends you should expect to see this year – according to Vogue magazine. The Duchess of Sussex wore a stunning halterneck gown, by Stella McCartney, for her evening reception – and they’re set to be all the rage this year. Tadashi Shoji is among the designers embracing the sleek, minimalist look for next year’s weddings. Brides will also be throwing it back to the 90s with wedding mini dresses, just like supermodel Cindy Crawford. Vera Wang, Elie Saab and Viktor & Rolf are all embracing the trend, which would be perfect for your evening reception, engagement party, hen, or even walking down the aisle. Everyone loves a statement sleeve, and they’re about to hit the wedding circuit in a big way. Expect to see lots of puffy lace, ruffled tulle and dropped balloon sleeves – which will save the need for a fussy veil or heavy earrings. Saint Laurent and Marchesa were both big on the feathered dresses in their bridal shows. Whether you’re looking to add some plumes to your neckline, or embellish your gown with feathers, it’s sure to help you stand out on your big day. Boho brides are donning kaftans to walk down the aisle, and now top designers like Naeem Khan, Reem Acra and Tadashi Shoji are getting involved too. Think sheer panels, beige tulle with gold embroidery and even kaftan jumpsuits. Vera Wang, Marchesa and Carolina Herrera are all turning to blue, blush pink and mint green gowns over classic white – just like Princess Eugenie and Chrissy Teigen, who wowed in red at her evening reception. A growing number of brides are ditching the veil tradition altogether, despite Meghan’s stunning 16-foot one – which covered the steps of St George’s Chapel. If you do want to get a veil, the 2019 runway is full of shorter, easier options, with Marchesa introducing a shoulder-length one for next year. If you are hosting a special event at home this year, you’ll want the place looking its very best and it’s the perfect excuse to redecorate! With that in mind, here are the hottest interior design looks on the horizon in 2019. The ever-influential Pantone has just released two colour palettes we will be craving in 2019. The very first palette ‘Cravings’ is inspired by food and is all rich reds, flamingo orange and rich purples, held down at the neutrals end by rich warm browns. ‘Classico’, as the name implies, is a collection of fundamental and everlasting colours that includes rich teal, grey flannel, rich gold and apricot. Meanwhile, ‘Night Watch’ has already been named paint colour of the year. It’s a deep, jade-like green that has strong references to nature. As one of the most inspiring, opulent and glamorous periods in design history, hints of Art Deco are popping up in detailing on tables, chairs, lighting and the mixed metals trend also gives a nod to the style. Expect to see bold, high-contrast designs all over your Instagram feeds in 2019, as matt black moves from fashion and beauty into homewares and interiors. Lighting, seating, home décor objects and sideboards are all key pieces you can introduce to reference the trend. Look for these in upholstered furniture, throws, cushions and tapestries, which are also getting some attention as a potential micro-trend to keep an eye on. As minimalism continues to blaze a clutter-free path through the interiors world, it is creating a demand for clean lines. In the kitchen, this is taking shape through a no upper cabinet trend. Staying in the kitchen, bold colours on both appliances and cabinetry is another trend coming to a kitchen renovation near you. Bar carts have been hot in 2018 and they’re not going anywhere in 2019. If you like entertaining and mixing the odd cocktail, a bar cart lets you take the elegance – and the party – anywhere in your home for maximum versatility. With black gold and bright golds being paired with raw natural finishes and high-end home appliances, gold has never looked so good.